A professional four-piece band from Rotorua, Count Me In has been together for more than nine years and is renowned for its reliability and accommodating attitude. Suitable for all age groups. If a sophisticated and upmarket evening of entertainment is what you seek, "Count Me In" is the band to make that special occasion. The band's musical styles are designed to satisfy the diverse and demanding corporate sector. Count Me In's repertoire includes well-known cover music including jazz, blues, country, rock and roll, rock, pop and disco. Top quality sound and lighting systems are used and are tailored to the needs of your function, be it a small intimate dining occasion or large conference. So if a sophisticated and up-market evening of entertainment is what you seek, Count Me In is the band to make any occasion special and memorable. Daryl, the band's leader, has grown up with music. He has won a number of awards leading him to study music at the University of Waikato. He represented New Zealand as a musician at Expo '88 in Brisbane and has more than 13 years' professional experience in the music industry. Daryl takes Count Me In seriously and you'll be sure to find him very professional, easy to work with and obliging. Kelly has been singing and playing the guitar since the age of six. At 17 in 1996, she was the youngest person to win the prestigious New Zealand Golden Guitar Awards and was the New Zealand Entertainer of the Year at the 1997 Trans-Tasman Awards in Norfolk Island. Rob has been playing drums professionally since he was 15. He has played and recorded at the highest music levels in the Auckland and Rotorua music industries. Rob moved to Rotorua and joined Count Me In back in 1992. Kent is a versatile guitarist with an outstanding sound and feel of his own. His experience and knowledge during the past 35 years of his musical career is a tribute to Count Me In. 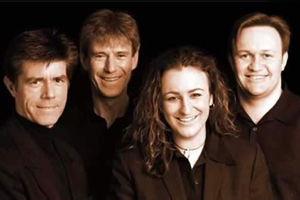 Without any doubt Count Me In is the best corporate band in Rotorua/Tauranga/Taupo basin.